In the poultry industry the difference between making profit or loss is often determined by the incidence of infectious diseases, writes Pauline Paap, Orffa Additives B.V.
Coccidiosis and necrotic enteritis are an important concern globally because of production losses, increased mortality, increased veterinarian and medication costs, reduced welfare of birds and an increased chance of contamination of products for human consumption. Although both diseases have a different pathology, they act synergistically since the development of necrotic enteritis is highly dependent on the intestinal damage caused by coccidiosis. Anti-coccidial drugs and conventional antimicrobial agents can be used to control the pathogenic pressure in the flock. However, the emergence of drug-resistant strains, especially after prolonged use of drugs, is a real problem. Therefore the poultry industry needs to search for alternative management and dietary strategies to control coccidiosis and necrotic enteritis. One of the dietary treatments could be the addition of butyrate, an energy source for epithelial cells that reinforces the intestinal barrier function. Coccidiosis in poultry is caused by a parasitic protozoan Eimeria. The main concern of coccidiosis is that disease is not related to a single Eimeria spp.. Infections are a results of a mixture of Eimeria species that invade different parts of the intestine as shown in the figure below (1). The intracellular parasite invades and destroys the epithelial cells of the host, causing severe damage to the intestinal wall. Figure 1: Nine different species of the parasitic protozoan Eimeria are known to infect different regions of the avian digestive tract, causing the disease coccidiosis. Colour of the square show the pathogenicity: green, least; yellow, less; orange, moderate – highly; red, highly. Nine different Eimeria species are known in poultry, of which there are only five to seven species associated with diseases in commercial flocks. Where a E. praecox infection is generally considered to produce little pathology, an infection with E. acervulina and E. mitis can already result in mild enteritis followed by fluid loss and malabsorption of nutrients. In more severe cases, inflammation of the intestinal wall with local bleeding (haemorrhages) and sloughing of epithelia (E. brunetti, E. maxima), or complete villar destruction resulting in extensive haemorrhage and death (E. necatrix, E. tenella) is seen in infected chickens (1) (2). Most of the highly pathogenic species invade the lower parts of the digestive tract. The life cycle of Eimeria is relatively short, at 4-6 days, and it consists of two developmental stages; exogenous (in feacal matter) and endogenous (in host digestive tract). The exogenous stage starts after the release of unsporulated (non-infective) oocysts in the faeces. Sporulation of the oocyst occurs in the faeces and is favored by the right temperature, humidity and aeration (access to oxygen). In the sporulated oocyst the so called sporozoites are formed and from that point on the oocysts are considered infectious. Sporulated oocysts are remarkably hard and protect the parasite from desiccation and chemical disinfectants, ensuring long-term survival in the poultry house environment (1) (2) (3). The endogenous stage starts after ingestion of the infective oocysts by the chicken. In the microenvironment of the gizzard sporozoites are released from the oocyst. Further in the digestive tract the sporozoites invade and destroy epithelial cells and start the highly efficient reproduction cycle. This involves several rounds of asexual reproduction followed by sexual differentiation, fertilization and shedding of unsporulated oocysts. The highly efficient copious reproduction of Eimeria species in the digestive tract and perfect survival strategy (sporulation) in faecal matter, increase the chances of infection in avian flocks (2). Good husbandry helps to reduce the risk of transmission of the coccidiosis-causing parasites. Additional treatments are essential, especially during the more delicate endogenous stage in the host digestive tract. Two categories of anticoccidial drugs are applied, those are ionophorous compounds (ionophores) and synthetic drugs (chemicals). Generally, ionophores cause death (coccidiocidal) to the parasite by interfering with the passage of ions across the cell membrane, whereas chemicals prevent the replication and growth (coccidiostatic) by inhibiting different biochemical pathways of the parasite (1). To reduce the emergence of drug resistant strains, shuttle and rotation programs are widely used (2). Still, the demand for alternative methods, such as vaccinations and dietary treatments, increases due to pressure from governmental agencies and consumers to ban the use of drugs in animals intended for human consumption. Moreover, in case of coccidiosis resistance towards anticoccidials leads to economic losses for the industry. Besides the number of ingested sporulated oocysts, the severity of coccidiosis is highly dependent on the existence of immunological memory to the pathogen. Johnson already published in 1923 the first articles showing that resistance to a dose of oocysts was not age dependent but relies on earlier exposure to the parasite (2). Nowadays we still make use of this knowledge through the application of live (attenuated) vaccines. From a dietary point of view different strategies can be used to fight coccidiosis. Some products have anti-microbial activities against Eimeria specific species such as essential oils and herbal extracts. Other products beneficially modulate the immune status of the chicken, where else pre- and probiotics improve microflora to reduce chance on secondary infections (e.g. C. perfringens). Destructed intestinal tissue benefits from additional antioxidants to reduce the vicious circle of oxidative stress caused by damaged cells (1). Other products improve intestinal protection and mucosal healing, like betaine, butyrate or threonine (4) (5) (6). Coccidiosis in poultry often pre-exists or occurs concurrently with field outbreaks of necrotic enteritis (7). The causative agent of necrotic enteritis is Clostridium perfringens, a gram positive spore forming anaerobe bacteria commonly found in soil, dust, faeces, feed, poultry litter and intestinal contents (8). Necrotic enteritis has long been controlled by the use of antibiotic growth promotors (AGP’s) in the feed. Nevertheless, in January 2006, in Europe the ban on dietary AGP’s came into place and also the use of AGP’s is under debate in other continents. Necrotic enteritis emerged as a common broiler disease worldwide (9) (10). The conventional therapeutic antimicrobial agents and anti-coccidial drugs, which not only exert an effect against Eimeria spp but also against C. perfringens, are currently used to control necrotic enteritis (8). However, this approach is in conflict with the objective to reduce the use of antibiotics in animal production. Understanding the pathology and predisposing factors of necrotic enteritis makes it helpful to search for preventive alternatives. Necrotic enteritis usually occurs 3-4 weeks after hatching (11). The necrotic lesions are mainly restricted to the small intestine and the infection can result in an acute clinical disease or is present in a subclinical condition. In clinical cases, there is increased flock mortality during the last weeks of rearing, often without premonitory signs. The disease is acute, with death occurring within 1 to 2 hours, and mortality rates can rise up to 50 per cent. Broiler flocks with subclinical necrotic enteritis do not display clear clinical signs and usually there is no peak mortality. Chronical damage to the intestinal mucosa leads to poor digestion and absorption of nutrients, resulting in reduced weight gain and increased feed conversion (9) (10) (12). In subclinical conditions feed intake can be reduced by 35 per cent during the infectious period (13). In certain cases intestinal damage can allow C. perfringens to reach the bile duct and portal blood stream. Colonisation of C. perfringens in the liver results in cholangiohepatitis, lesions to the liver which are finally found at the slaughter line (12) (14). Although clinical outbreaks of necrotic enteritis may cause high levels of mortality, the subclinical form is economically more important as it often stays undetected in the broiler flock. Hampered growth and an increased number of condemnations at the slaughter line causes great economic losses to the poultry farmer. The true economic impact of necrotic enteritis is not from birds that die from infection, but those who suffer from disease and survive the subclinical form (12). Clostridium perfringens is commonly found in the normal healthy avian gut microbiota. The virulence of a strain depends on its nature. Strains of C. perfringens are classified into five different types (A to E) on the basis of the production of four major toxins. Clostridium type A is associated with necrotic enteritis in broilers, although this type is also found in the digestive tract of healthy poultry (9). As necrotic enteritis is a multifactorial disease, more predisposing factors are needed for the development (figure 2) (10). Figure 2: Predisposing factors for necrotic enteritis; a multifactorial disease. High levels of (animal) protein or poorly digestible protein sources are associated with higher risk for necrotic enteritis, as undigested protein is a growth substrate for pathogenic bacteria such as C. perfringens. Wheat, rye, oats and barley are more often associated with necrotic enteritis, due to higher levels of indigestible, water soluble, non-starch polysaccharides. Whereas maize is not. Beside the choice of raw materials, also particle size seems to influence gut health. Feed containing many small and some large-sized particles is more predisposed to necrotic enteritis than feed containing uniform particles (7) (10) (15). Changes in the feeding regime (moving from starter to grower diets), other diseases and increased stocking density increase stress in the flock and suppress the immunological status of the chickens making them more sensitive to necrotic enteritis infection (12). Coccidiosis infection is an important predisposing factor as the mucosal damage caused by Eimeria provides a favourable environment for C. perfringens to proliferate. Synergism between coccidiosis causing protozoan Eimeria and necrotic enteritis inducing C. perfringens is shown in figure 3. By killing epithelial cells, Eimeria induces leakage of plasma proteins (A) and the coccidial infection enhances mucus production (B). Both effects provide an increased nutrient availability for C. perfringens to grow (12). 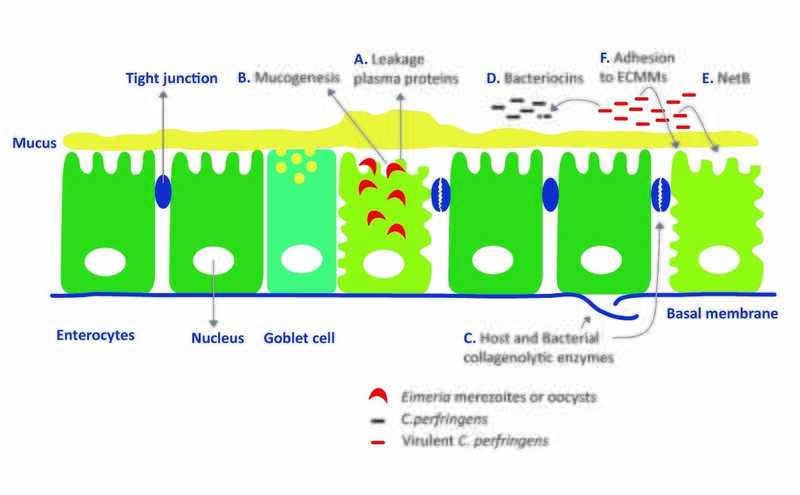 Virulence of the C. perfringens strain depends mainly on four major factors; on its ability to produce bacteriocins, bacterial collagenolytic enzymes, toxins and its ability for adhesion to the gut wall (figure 2). In the initial stage of necrotic enteritis, collagenolytic enzymes affect the extracellular matrix and cellular junctions. Both host collagenases (probably stimulated by coccidial infection) and bacterial collagenolytic enzymes may play a role in the disorganization or even complete destruction of the cellular matrix and the tight junctions between epithelial cells (C). Production of bacteriocins by a virulent strain inhibits the growth of other C. perfringens strains in the gut. This to obtain the maximum benefit of increased nutrient availability released by the coccidiosis infection (D). (12). For long time α-toxin was proposed as the main virulent factor for C. perfringens inducing necrotic enteritis. Recently researchers described a novel toxin NetB. This toxin seems to be involved in the induction of necrotic lesions by forming pores in epithelial cells leading to cell death (E) (9). Virulent strains of C. perfringens are capable of binding to extracellular matrix molecules (F), a survival strategy used by numerous bacterial enteropathogens. Normal healthy intestinal epithelium doesn’t expose these extracellular matrix molecules. Because of the intestinal damage induced by Eimeria, NetB toxins and the colleagenolytic enzymes, C. perfingens is better able to bind and colonise in the digestive tract, resulting in even more severe lesions (12). Strategies to control necrotic enteritis without the use of AGP’s and prophylactic or therapeutic treatment is challenging. To date, there is no single strategy against C. perfringens associated necrotic enteritis. The combination of good hygiene management of poultry houses, use of vaccination (against C. perfringens and coccidiosis) and dietary interventions can, to some extent, be an alternative for antibiotics to maintain production and control necrotic enteritis. Low protein diets or use of highly digestible protein sources in combination with enzymes to break down the undigestible structural components in the diet will reduce the opportunity for C. perfingens to develop in the gut (8). Also, the use of additives to control coccidiosis, as earlier mentioned in this article, is a helpful tool to reduce the incidence of necrotic enteritis. The constant immunological challenge by Eimeria species concurrently with C. perfringens, makes the barrier defence function of the epithelial layer of great importance. Butyrate is a short chain fatty acid naturally produced in the digestive tract by the fermentation of fibres. The fatty acid is considered the most important energy source for intestinal cells and has multiple beneficial effects on vital intestinal functions. Research (10) and practical field experience confirm that butyrate alone or in combination with other dietary strategies reduces the incidence of necrotic enteritis. Butyrate possesses a direct antimicrobial effect to C. perfringens, but this doesn’t seem to be the main factor involved. Butyrate concentrations in the digestive tract, coming from fermentation or even in combination with supplementary sources, will not reach the level required to inhibit the development of C. perfringens directly. The positive effect of butyrate is probably more related to the effects on the avian intestinal function (10). Already in the small intestine butyrate favours the villi development, gut morphology and function (16). Further on in the digestive tract, butyrate represents the preferred energy source for the colonic cells (5) (17) and is a major precursor for lipid synthesis, used for incorporation into the cell membranes (18). By supporting the cell membrane structure, butyrate contributes to the maintenance of barrier and transporter functions in the gut (18). Ma et al (19) observed an important role of butyrate in the intestinal wound healing by its positive effect on tight junctions and gut integrity. At low concentrations butyrate reinforces the intestinal defence barriers by increasing the release of protective mucins in the mucus layer (20) (21) and the release of antimicrobial peptides (22) (23) (24). These peptides, also mentioned as host defence peptides (HDP’s) possess a broad spectrum antimicrobial activity against bacteria, protozoa, enveloped viruses and fungi. HDP’s bind to the microbial membrane and cause membrane disruption which results in microbial death (25). The research group of van Immerseel (26) shows another antimicrobial efficacy of butyrate, whereby the fatty acid reduces the ability of pathogenic bacteria for adhesion to the gut cell wall. Finally, butyrate plays a role as an anti-inflammatory agent (27) (28). Tempering the inflammatory status of the chicken is a useful tool to overcome feed intake reduction and thereby reduces break down of muscle tissue during necrotic infection (13). Uncoated butyrate will be directly absorbed in the first part of the small intestine and will not reach the lower parts of the digestive tract (29). Proper coating of dietary butyrate is essential for a targeted release of the fatty acid over the whole digestive tract (30) (31). By testing the microencapsulated butyrate product Excential Butycoat, as well in vivo as in vitro, it is shown that all butyrate passes the stomach and is gradually released in the intestinal tract. Since the ban on in-feed antibiotics, necrotic enteritis caused by C. perfringens has re-emerged in avian flocks with a severe economic impact. As the occurrence of drug resistant strains is an important problem for public health and for long-term control strategies against necrotic enteritis, solutions to control necrotic enteritis have to be found in alternatives to the conventional medication. Nutrition strongly influences the incidence of necrotic enteritis and the other pre-existing pathogenic infection coccidiosis. Proper micro-encapsulated butyrate in the diet ensures the targeted release of butyrate over the whole digestive tract, which supports the intestinal cells and reinforces the mucosal barrier function damaged by Eimeria species and C. perfringens. 1. Control of avian coccidiosis; future and present natural alternatives. Quiroz-Castaneda, R.E. and Dantan-Gonzalez, E. 2015, BioMed Research Inernational, p. Article ID 430610. 2. Milestones in avian coccidiosis research; A review. Chapman, H.D. 2014, Poultry Science 93, pp. 501-511. 3. Coccidiosis in poultry: anticoccidial products, vaccines and other prevention strategies. Peek, H.W. and Landman, W.J.M. 2011, Veterinary Quarterly Vol. 31, No. 3, pp. 143 -161. 4. Potential nutritional and physiological functions of betaine in livestock. Eklund, M., et al. 2005, Nutrition Research Reviews 18, pp. 31-48. 5. From the gut to the peripheral tissues: the multiple effects of butyrate. Guilloteau, P., et al. 2010, Nutrition Research Reviews, pp. 1-19. 6. Threonine requirement of broiler chickens during subclinical intestinal Clostridium infection. Star, L., et al. s.l. : Poultry Science 91, 2012, Poultry Science 91, pp. 643-652. 7. Intercurrent coccidiosis and necrotic enteritis of chickens: rational, integrated disease management by maintenance of gut integrity. Williams, R.B. 2005, Avian Pathology 34 (3), pp. 159-180. 8. Potential strategies for controlling necrotic enteritis in broiler chickens in post-antibiotic era. Dahiya, J.P., et al. 2006, Animal Feed Science and Technology 129, pp. 60-88. 9. Rethinking our understanding of the pathogenesis of necrotic enteritis in chickens. Van Immerseel, F., et al. 2008, Trends in Microbiology Vol. 17 No. 1, pp. 32-36. 10. Control of Clostridium perfringens-induced necrotic entertitis in broilers by target-release butyric acid, fatty acids and essential oils. Timbermont, L., et al. 2010, Avian Pathology 39 (2), pp. 117-121. 11. Progress and problems in vaccination against necrotic enteritis in broiler chickens. Mot, D., et al. 2014, Avian Pathology, Vol 43, No. 4, pp. 290-300. 12. Necrotic enteritis in broiler: an update review on the pathogenesis. Timbermont, L., et al. 2011, Avian Pathology, 40(4), pp. 341-347. 13. Necrotische enteritis model geeft inzicht in voereffecten. Lensing, M. and Fabri, T. 2007, De Molenaar nr. 9, pp. 14-16. 14. Clostridium pergringens in poultry: an emerging threat for animal and public health. Van Immerseel, F., et al. 2004, Avian Pathology 33 (6), pp. 537-549. 15. 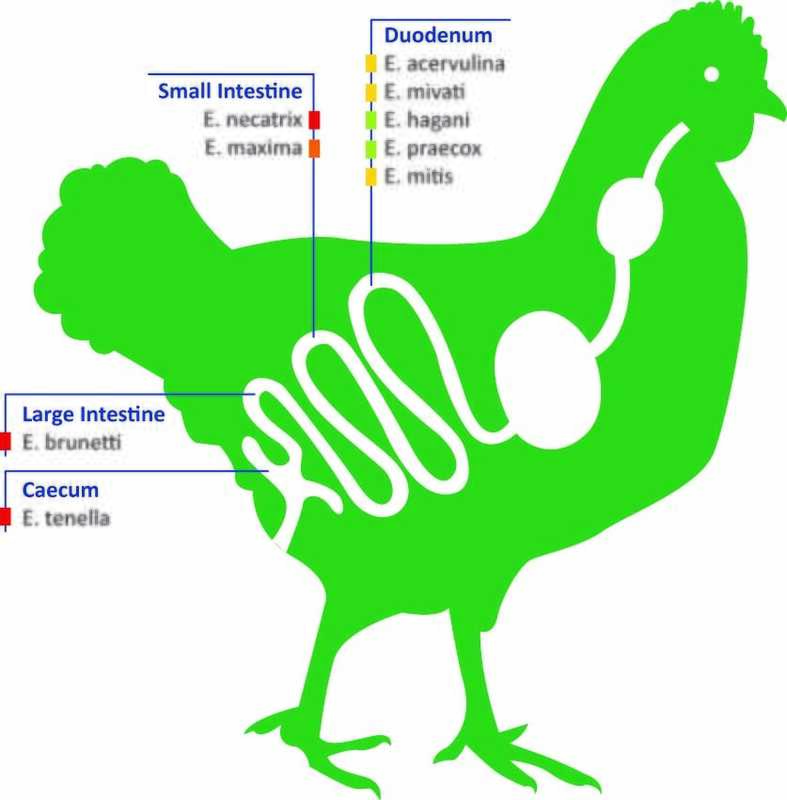 Necrotic enteritis in chickens: a paradigm of enteric infection by clostridium perfringens type A. Cooper, K.K. and Songer, J.G. 2009, Anaerobe 15, pp. 55-60. 16. Effects of feeding fat-coated butyrate on mucosal morphology and function in the small intestine of the pig. Claus, R., Gunthner, D. and Letzguss, H. 2007, Journal of Animal Physiology and Animal Nutrition 91, pp. 312-318. 17. Review article: role of butyrate on colonic function. Hamer, H.M., et al. 2008, Alimentary Pharmacology & Therapeutics 27, pp. 104-119. 18. Acetate and butyrate are the major substrates for de novo lipogenesis in rat colonic epithelial cells. Zambell, K.L., Fitch, M.D. and Fleming, S.E. 2003, Journal of Nutrition 133, pp. 3509-3515. 19. Butyrate promotes the recovering of intestinal wound healing through its positive effect on the tight junctions. Ma, X., et al. 2012, Jounral of Animal Science 90, pp. 266-268. 20. Butyrate: implications for intestinal function. Leonel, A.J. and Alvarez-Leite, J.I. 2012, Curr Opin Clin Nutr Metab Care, 15, pp. 474-479. 21. Intestinal health functions of colonic microbial metabolites: a review. Havenaar, R. 2011, Beneficial Microbes, June; 2(2), pp. 103-114. 22. Butyrate enhance disease resistance of chickens by inducing antimicrobial host defense peptide gene expression. Sunkara, L.T., et al. 2011, PLoS ONE 6 (11): e 27225. 23. Efficacy of sodium butyrate adjunt therapy in shigellosis: a randomized, double-blind, placebo-controlled clinical trial. Raqib, R., et al. 2012, BMC Infectious Diseases 12:111. 24. Improved outcome in shigellosis associated with butyrate induction of an endogenous peptide antibiotic. Raqib, R., et al. 2006, Proc. Natl. Acad. Sci USA vol. 103, no. 24, pp. 9178-9183. 25. Tizard, I.R. Veterinary Immunology, an introduction. St. Louis, Missouri 63146 : SAUNDERS Elsevier, 2009. 26. The use of organic acids to combat Salmonella in poultry: a mechanistic explanation of the efficacy. Van Immerseel, F., et al. 2006, Avian Pathology 35 (3), pp. 182-188. 27. The epigenetic effects of butyrate: potential therapeutic implications for clinical practice. Canani, R.B., Di Costanzo, M. and Leone, L. 2012, Clinical Epigenetics 4:4. 28. Potential beneficial effects of butyrate in intestinal and extraintestinal diseases. Canani, R.B., et al. 2011, World Journal of Gastroenterology, march 28; 17 (12), pp. 1519-1528. 29. Effects of dietary sodium butyrate supplementation on the intestinal morphological structure, absoptive function and gut flora in chickens. Hu, Z. and Guo, Y. 2007, Aniemal Feed Science and Technology 132, pp. 240-249. 30. Coated fatty acids alter virulence properties of Salmonella Typhimurium and decrease intestinal colonization of pigs. Boyen, F., et al. 2008, Veterinary Microbiology 132 , pp. 319-327. 31. Supplementation of coated butyric acid in the feed reduced colonization and shedding of Salmonella in poultry. Van Immerseel, F., et al. 2005, Poultry Science 84, pp. 1851-1856.